bykStyle | Stars, Stripes & Sass: 3 reasons versatility is a budget MUST while transitioning seasons! Ya’ll we are heading into the 4th quarter! Can you believe it!? Yea, me neither. 2017 has been flying right by us and has us spinning like……. Shyt is bananas/ But just before the end of the year, we have to head into one of my favorite seasons, FALL!!! that’s right it… fall is my ISH. The perfect verse over a tight beat. PUMPKIN SEASON!! Home of mine and Sol’s birthday month and most of all it’S…………. FALL FASHION season!! Oh it’s heaven, ya’ll. The boots, cardigans, peacoats and fall lippies keep us swimming in Autumn bliss. We can’t wait! Now my bank account on the other hand shares a different narrative. Yes, a bish is on a BUDGET big time. With building an empire as well as making some moves on the home front, I am steadily trying to find a way to save a dollar or 12k. Straight Mr. Crab style. One of my main areas to cut back on is my wardrobe. Yes, I know, the horror! It’s so easy to try to fill my closet with all types of fall goodness from the top brands like Eloquii, River Island and more but my wallet isn’t always in a position to cash those kinda checks, if you understand what I’m putting down. So as a boss chica on a tight budget, I have found that one of the best ways to keep my transitioning price tag low is by purchasing pieces with versatility I can utilize in different seasons! Girl, a GAME CHANGER! What’s clothes versatility you might ask? Well, it’s the ability to adapt your clothing to many different functions or activities. And that’s exactly what I want my clothes to do is function all through the year. Because I am hot natured, my season of choice to stock up is summer style items. I am all about taking short sleeve shirts and skirts and transitioning them into my fall regime with the adding of a cardigan, tights or blazer, just in case it gets a little chilly. Get a few more tips on transitioning into fall fashion here. A minimalist lifestyle is totally ideal when it comes to those with limited space. Whether you stay in a small space or share a closet with bae, closet space is always an essential piece. Listen, sharing a closet with your partner can stress you the hell out and make you rethink this “til death do us part” bit. And when you buy clothing pieces that can transition into different seasons, less space is taken up and that’s always bomb! Yes, Kiki’s tips is out here saving marriages and ish! There is nothing like a good end of the season clearance sale. It is the ultimate jump-off because you have the ability to grab deals for next to nothing. Remember that budget I was talking about. This is another way shopping for versatile options comes in handy and assist in helping you get your life right! 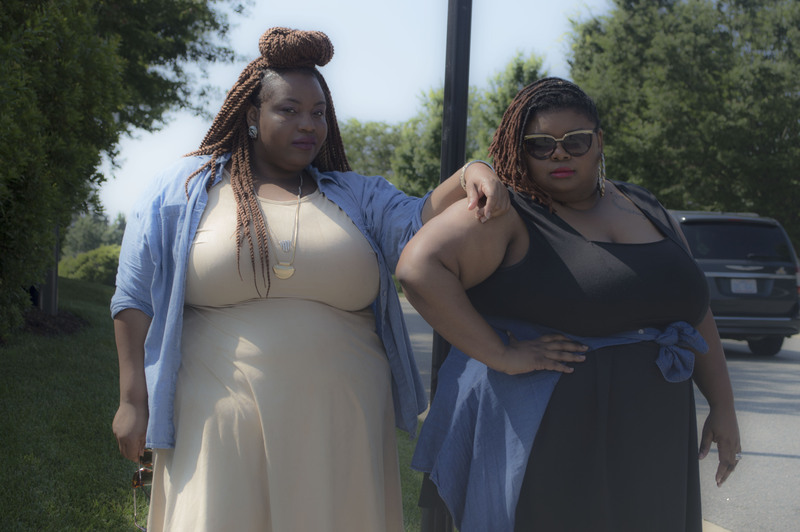 Because we all shop most of the same plus size retailers, it’s easy to get in the rut of seeing doubles and triples of the same piece on your favorite bloggers or everyday ladies in the streets. This is why you have to be creative when it comes to your style and make the looks your own. When you shop versatile pieces from other seasons to transition into the next, you end up with unique and . Prints such as stripes, plaid and florals splashing into the fall like Wo! Check out how to dress those strips on a plus diva here. Another bonus of shopping outside of your designated season is the exclusiveness, very similar to when you thrift. I mean listen, you don’t want to end up looking like someone else while you are out here in dem streets trying to slay the night away. I mean, ya’ll remember that episode of Living Single with Regine, right?? It can happen. Now that I have shared the tea with you on how to save some coins and be stylish in the process, go forth and be great boo! And this Labor day weekend is the perfect time to stock up with some amazing deals from your favorite retailers.. I know I am! Starting first with this super cute transitional outfit I purchased below! As you can see most items are on clearance and wallet friendly! I mean under $100 for two outfits! Can I hear someone say HELL YAY! Happy clearance shopping lovelies! What Summer pieces do you plan on taking into the Fall Fashion Season? Wardrobe versatility is a MUST for me – I have a very limited budget, and I’m moving into quite a tiny apartment in the next few weeks and I need any extra inch of space I can get! I’m all about wearing the same basic T-shirts all year round and just throwing a cardigan on top in the fall/winter. I honestly thought you were wearing a dress! I didn’t realize till the end of the post that it was a top and skirt. So cute!! I love it. Great advice! I love those end of season sales, especially at the end of summer. Like yourself, I wear summer apparel year round! Tops, dresses, and skirts anyway! I am LOVIN’ how many ways you styled that cold shoulder top! Such a great look in so many different ways!